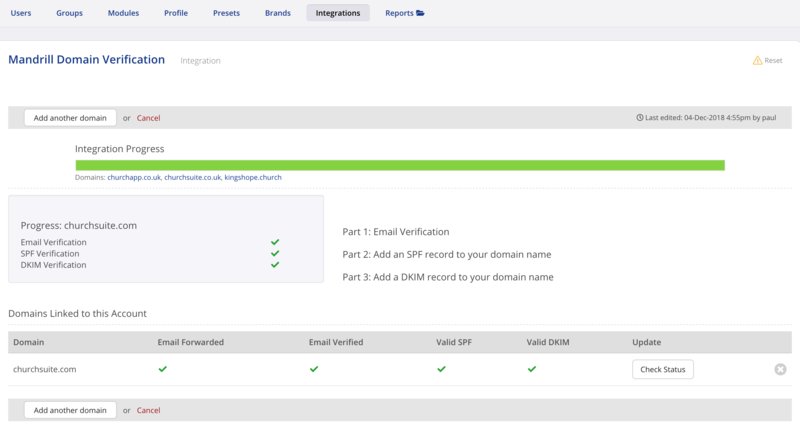 This article explains how to complete the domain verification process, so that ChurchSuite's email service has permission to send emails on your church's behalf. Domain verification increases email security and deliverability, while also helping protect your domain reputation from 'spoofing'. Until your church's domain name has been verified, all outbound emails sent from your ChurchSuite account will show as being sent 'From' yoursubdomainname+user-username.out.churchsuite.com, as "out.churchsuite.com" is a verified domain. Note that the 'Reply to' email address will always show your user's email address, so that replies are correctly routed. However, there are a small number of email hosts that do not respect 'reply to', which could result in email replies not being delivered back to the user. We therefore encourage you to take time to complete your church's domain verification. This only needs to be done once for each registered email domain used by your users for sending emails from within ChurchSuite - it doesn't need to be done for every user! Begin by entering a valid Email Address within your church's domain - ideally an email address that you receive replies to. Click Save and Proceed. Now check your email inbox - Mandrill Client Services will send you a domain verification email that must be forwarded to us at ChurchSuite. If the email doesn't arrive, check your spam folder. The email comes from help@mandrill.com and contains information that we at ChurchSuite need in order to complete the verification of your domain against your ChurchSuite account. Note that you can abort and Reset the Integration at any time in order to request another email from Mandrill, if you need to. Be aware, however, that each Mandrill verification email causes all previously requested emails to expire, so you must send us the latest email that you receive. This stage simply involves ticking to confirm that you have forwarded the Mandrill email to us at ChurchSuite Support. Once we receive that email and process it, we'll send you a confirmation email back advising that you can proceed to the final stage. Now you can tick the box in Stage 2 and click Save and Proceed. This stage can be trickier as it requires a little technical 'know how' and access to the DNS settings in your domain host's user control panel. Essentially you are going to add two new text records (TXT) to your DNS settings. Navigate to the advanced DNS settings in the control panel for your domain host. Follow your domain host's instructions for adding the following two DNS records. Your domain host should provide support articles on how to add DNS records; alternatively you may wish to reach out to their online support for help with this. A DKIM record authorises an email service to send out emails on behalf of your domain name, in this case, it authorises ChurchSuite to send out emails from your @yourchurchdomain.org. You will need to create a new TXT record for mandrill._domainkey.yourchurchdomain.com (where yourchurchdomain.com is your church's domain name). Note that some host providers will automatically append your church's domain name to a DNS record, and so you may simply need to add in the prefix part, i.e. mandrill._domainkey. An SPF record is similar to a DKIM record in that it authorises emails to be sent out from your domain name by a third-party service. If you have an existing SPF record, with an existing value, perhaps with other 'include' statements, you need simply edit the existing record and adding include:spf.mandrillapp.com before the final all statement - be careful not to overwrite any of the existing 'include' statements - just append include:spf.mandrillapp.combefore the final all. Note that you can only have one SPF record in DNS. If your SPF entry isn't being recognised as valid, check that you don't have more than one SPF record! While you might have multiple DKIM records, you should only have one SPF record in your DNS. If you've done everything correct, clicking Save and Proceed will set the integration progress bar to full completed. If you have more than one domain to verify - perhaps because your organisations sends emails through more than one email domain name, you can click Add another domain and repeat Stage 1 again. 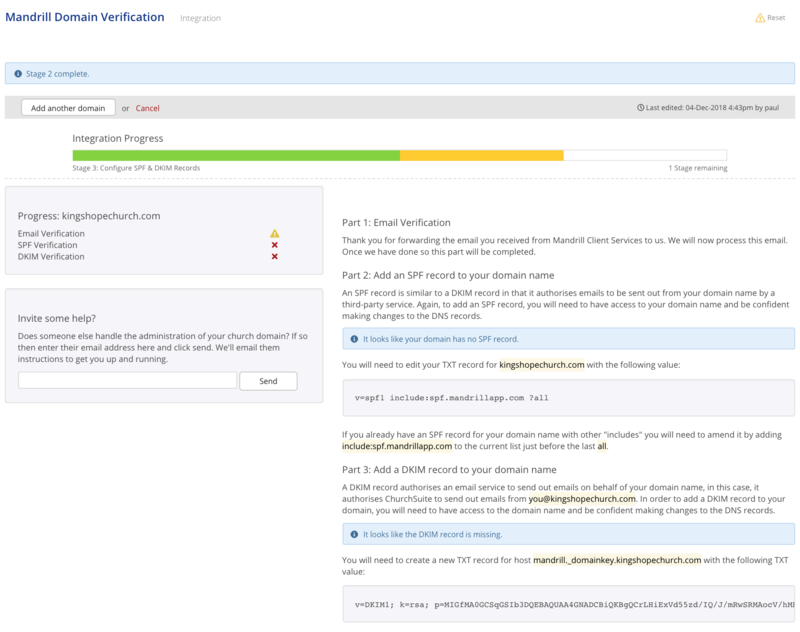 - ChurchSuite tracks the progress of each domain's verification through each stage. Once you have completed adding the two DNS records and saved all your changes, switch back to ChurchSuite and head back into the Mandrill integration again. It can sometimes take a few hours for DNS changes to propagate over the internet. However, if you've done everything correctly then the Mandrill Integration will show four green ticks and the progress bar will be 100% green. Click Finish to close and complete the Integration - you're all done, and your domain has been verified! Outbound emails sent through your ChurchSuite account will now showing correctly as originating from the email address within your verified domain (if a domain email address has been correctly associated with each User's profile). Remember, you only need to complete domain verification once for each of your church's domains. It is not necessary to verify each individual user's email address that exists within the same domain!